← Successful Brimhay Judicial Review victory gives hope to communities across the UK. What plans for our place? So amidst all the summer holidays, did you manage to respond to the draft local plan? It seems to us that if the planners really wanted to know what we thought about their ideas for our place they might have asked at a time when most of us are not away or entertaining children on the long summer break! A piece in the paper or sent to our doors might have been easier to navigate than their complex web site. Well done if you did respond via a letter, DBDUC’s simple response card to make it easier,) or came to the exhibition in July at the village hall. 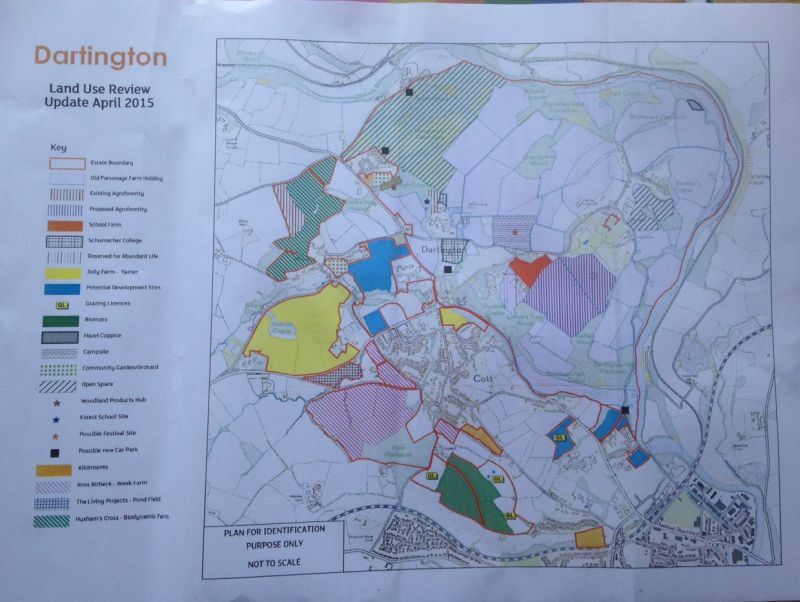 For DBDUC, we dispute that Dartington needs a 60% increase in size over a few years (when the average given through the pan is 16%). We wonder why when 6000 houses are to be allocated over the 60 parishes of the South Hams, Totnes and Dartington should get 1200 of them and are disgusted that planners propose building over Totnes market, the town car parks and Leechwell Gardens , in a short term bid to raise cash from the land SHDC owns- destroying our fabulous historic town in the process. It seems they are way out of touch with most residents’ views. For Dartington, whilst DBDUC argued the numbers- saying we could sustainably cope with only half the 470 they proposed, we supported more imaginative plans from DHT for some building around Foxhole and Higher Barton Farm (around the overflow car park near the Hall) – even a few cutting edge eco homes next to Schumacher, built as part of their courses- but not the numbers given. We were pleased to see DHT pulling development away from the fields opposite the church and making these open spaces with a few small eco cabins, annoyed but not surprised that planners preferred the large open field of Broom Park for 100 houses. So sad that they had not got the imagination to work with DHT on developing pockets of innovative housing that could be accepted into the estate with its special landscape and listed buildings; for having such a status helps ensure that any new builds are of high quality too. Having put Broom Park in as an ‘insurance policy’ locals need to work with DHT and the Neighbourhood plan to suggest other acceptable uses than roads of clone houses. Woodland burial site? Growing spaces? Sports and youth facilities ( to use the temporary school buildings) anyone? Over to you. When standing in the Royal Courts of Justice on one of the hottest days this year- and looking at the 1000 page ‘barristers bundle’ that compiled all our correspondence on Brimhay- the sheer volume of work involved in taking a judicial review was brought home. Granted a JR on four grounds; that SHDC had ignored our application for an Asset of Community Value over the site, ignored our application for a Public Right of Way, ignored European wildlife legislation to protect dormice- the judge granted us victory on one. This was that the case officer did not explain that SHDC has a policy to safeguard public open space- no matter if it’s in private ownership, so not making councillors aware that they would be going against that policy by saying yes to South Devon Rural Housing’s scheme was illegal. The judgement meant that the planning permission was quashed. Our sincerest thanks to Brimhay resident Liz Wilkinson for taking the JR case on the community’s behalf. That a small community can overturn its local authority’s decision is rare. As we celebrated what we had all achieved sunk in. Weeks later after a bat survey, our alternative scheme was validated and is with SHDC planners to determine. Meanwhile two builders have visited Brimhay and told us that all 18 bungalows could be greatly improved and brought up to modern homes standard for under £15,000 each- the funds could be raised by building just 2 high spec eco houses with no threat to the wild valley. It begs the question why SDRHA ever went to the extent of developing a £4m scheme- that lost 6 social homes in the village? Now, unbelievably, with two positive, community supported alternatives on the table , SDRHA have ignored us and the parish council- and propose putting in exactly the same scheme for planning- just telling councillors to go against their open space policy to do so. This I’m told might be done without further community consultation! As I write, we are asking planners to broker round table talks and help achieve a positive outcome for Brimhay- one that works with the community- not forces a scheme against so many local people’s wishes and at the expense of tenants and the environment. We might be talking, or we might be fighting planners again by the time you read this. Let’s hope we can have a real celebration for Brimhay this time.